Tavis Smiley says he's never coerced anyone into a relationship but has had consensual relationships in the workplace. 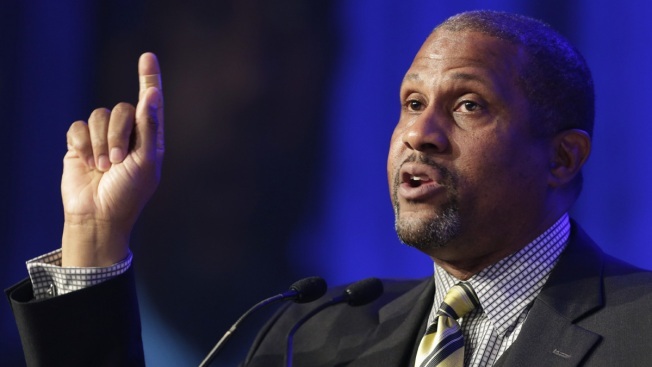 Tavis Smiley has defended himself from allegations he had sexual relationships with subordinates and created an abusive workplace environment, denying any wrongdoing and saying PBS made a mistake by suspending him from his talk show. PBS almost immediately fired back, saying he "needs to get his story straight." He told ABC's "Good Morning America" Monday that he's never coerced anyone into a relationship but has had consensual relationships in the workplace. He said those relationships weren't forbidden by the company he owns and he claims he never promoted or fired anyone based on their relationship with him. "I've never groped. I've never coerced, I've never exposed myself inappropriately to anyone in 30 years," Smiley said. "I've made mistakes — I'm human. I'm not perfect. But it doesn't rise to the level of wrongful termination." Smiley said Monday that he applauds women coming forward to share their sexual assault and harassment experiences "to lead us in a conversation about how to create healthy workspaces." At the same time, he said "I want to make sure we don't lose all sense of nuance and proportionality in this conversation, because if we do then people end up being guilty simply by accusation." PBS responded in a matter of hours, saying Smiley's acknowledgement of multiple relationships contradicted his previous statements. "Tavis Smiley needs to get his story straight," it said in a statement, which also promised more accusations: "Additional allegations are continuing to come to light since last week's announcement." PBS also derided Smiley's claim that he applauds women who have come forward, pointing out that Smiley's company hinders such actions by requiring former and current employees to sign non-disclosure agreements. "Witnesses who have bravely come forward to speak with the independent investigators retained by PBS report a fear of retribution for speaking out," it said. Smiley's career took a huge hit last week when PBS said it was suspending him following an independent investigation by a law firm that uncovered "multiple, credible allegations of conduct that is inconsistent with the values and standards of PBS." Then fallout was swift: Walmart, a sponsor, cut ties with him and live producer Mills Entertainment pulled out of backing Smiley's upcoming theatrical show that was to focus on the last year of Martin Luther King Jr.'s life. Hay House, which distributes the Smiley Books imprint, said all Smiley projects were "on hold" pending an internal review. As to accusations he created a verbally abusive and threatening work place, Smiley admitted many of his TV and radio projects are intense at times but said "I'm not an angry black man and this notion of a hostile environment just doesn't fit." He added that no complaints about him have ever been raised. Smiley's suspension comes weeks after PBS cut ties with anchor and talk show host Charlie Rose, citing "extremely disturbing and intolerable behavior" by him toward women at his PBS talk show. The actions against Smiley and Rose follow dozens of firings and suspensions of prominent men who have been accused of sexual misconduct or harassment.